The bathroom is one of the main rooms in your home that you use for relaxation and possibly even luxury. Today the trends in bathroom remodeling are leaning towards giving bathrooms the feeling of being at a luxurious spa; they are opting for more spacious bathrooms with larger fixtures and appliances to give your bathroom a sophisticated feeling. With today’s economy in the state that it is in, people are visiting spas less frequently, so having luxurious bathroom that has the ambiance of a spa is the next best thing for many homeowners. Achieving the spa feeling in your bathroom is easy to achieve and can be done at any level from moderate to completely luxurious. It is easy to achieve the customize retreat you are looking for in your bathroom. It all starts with the paint on the walls in your bathroom. It used to be trendy to have bright or bold colors covering your walls, but now the trend is light and calm. Choosing colors such as grey or beige allow your senses to be automatically soothed just by stepping foot into the bathroom. For bathroom remodeling that has a vast budget, changing the windows in your bathroom can also help to give you the spa-like feeling. Changing your windows out for larger windows or even skylight windows will allow more natural light into your bathroom. Natural light is the best light that you can bring it to your bathroom not only because it is soothing but it is also healthy, giving you many benefits to making window replacements part of your bathroom remodeling budget. If your bathroom has the room, spread out the floor plan to allow more open space. 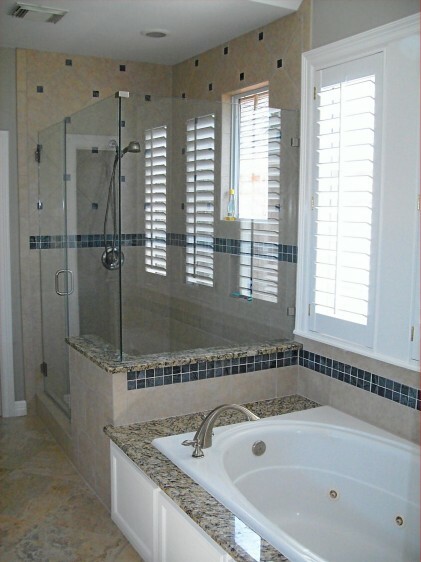 If you do have a large bathroom, large soaking tubs are a great addition to your bathroom. They not only give your bathroom a grand look, but they also give you a place to soak your worries away after a long day on the job. If you do not have the room or the desire for a large soaking tub, a frameless shower will give your bathroom the same elegant look, while also giving your bathroom the feeling of being larger than it is. If you are going to change your faucets or fixtures, opt for those that are ornate and classic looking as they offer the greatest feeling of sophistication and grandeur. Today’s trend is leaning back toward the classic style in looks only. Just because the faucet looks like it might have belonged in your grandmother’s home, does not mean it acts that way. Today’s fixtures have the antique look with today’s technology – giving you the best of both worlds. Whether you choose one of these ideas for remodeling your bathroom into your own personal spa or you choose all of them, you are sure to have a luxurious, relaxing feeling in your bathroom that helps you to unwind and relax, all while increasing the value of your home.